Espino was born June 6th, 1939 in Chihuahua, Mexico. A 5’11” 185lbs. outfielder, the 20 year old got his start in baseball playing in the Mexican Central League for San Luis Potosi (the equivalent to class A baseball). After dominating MCL pitching, he was called up to the Mexican League. His rookie season came in 1962 when he broke in to the Mexican League by playing for Monterrey. 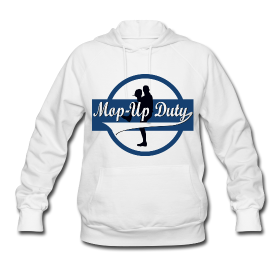 He won the Rookie of the Year that season by hitting 23HR, 12 triples and driving in 105. Two seasons later in 1964 Espino was en fuego. That year he shifted from the outfield to first base and won the league batting title with a line of .371/.479/.741 while also smashing 46HR, scoring 115 runs and driving in 117. Stud. Because of his obvious studliness, the St. Louis Cardinals sat up and took notice. They signed him to a minor league deal and dispatched Espino to their AAA affiliate in Jacksonville. He did well in Jacksonville, hitting .300 with 3HR in only 32 games. Despite his success he returned to due to the culture shock, homesickness and prevalent racism that he experienced at the time. Upon his return to the Mexican League, Espino picked up where he left off, winning another batting title with an average of .369, beating out Cuban star Minnie Minoso by 21 points. Espino’s production dropped off in 1970 and subsequently he was dealt to the Tampico Alijadores (Dockworkers). Tampico’s gamble paid off as he returned to form in 1972 (.356/37HR/101RBI) and 1973 (.377/22HR/107RBI) at age 35. 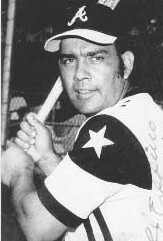 Following the 1973 season Espino’s production began to slow down, yet he played for another 10 seasons, retiring at the age of 45. One of the highlights of Espino’s career was that he was intentionally walked with the bases loaded in a playoff game! Espino was also a Mexican Winter League star, playing 24 seasons for the Hermosillo Naranjeros and swatting 299 home runs. Over the course of those 24 seasons, Espino won 13 batting titles, 6 home run crowns and 6 MVP awards, leading Mexico to its first Caribbean series win in 1976. 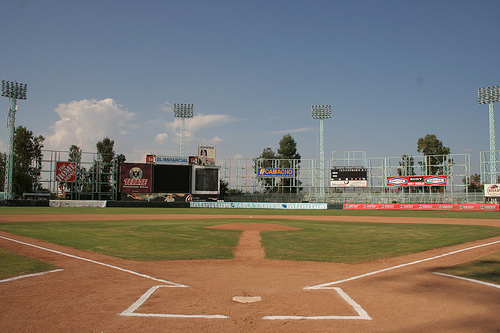 That same year Espino had the stadium in Hermosillo named after him – “Estadio Hector Espino.” The stadium was the first ballpark in Latin America to have a digital LED scoreboard. 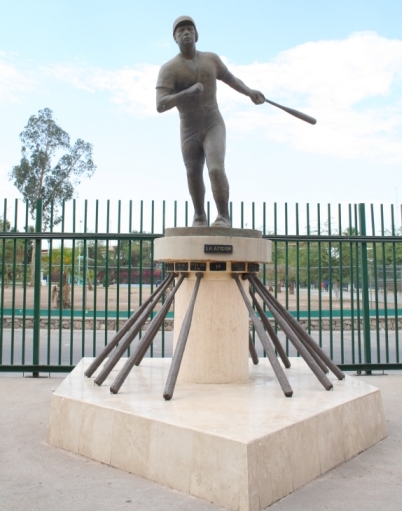 The 16,000 seat stadium also features a statue of Espino and the base of the statue is formed by a list of his 53 minor league batting records, most of which still stand. Hector Espino retired in Monterrey, NL on July 19, 1984 at the age of 45. Espino was inducted to the Mexican Baseball Hall of Fame in 1988. He is also enshrined in the Caribbean Baseball Hall of Fame. 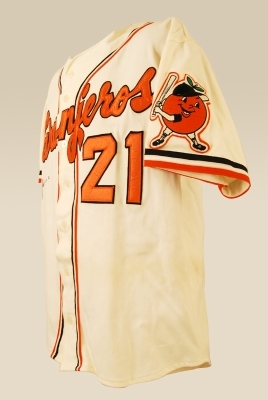 After retiring, Espino managed the Hermosillo Naranjeros of the Mexican Pacific League before passing away in 1997 due to a heart attack at age 58. Espino also had one other nickname: “The Child Murderer.” I have no idea how he got that one. Espino was beloved by fans across Mexico because he combined his great skills in baseball with a sense of pride and loyalty for his country to become the face of Mexican baseball for two decades. He was a true national hero, and (as with Jackie Robinson) his number 21 has been retired by all Mexican professional teams. There are as many ways to compare Hector Espino with Robinson as there are to measure him by Ruthian standards. The question of how successful he might have been had he remained in the United States is a poor one. The fact that he became an icon among baseball fans in his home country indicates he didn’t need to be a star in the USA to be a success where it mattered most to him. Outstanding write-up of an outstanding ball player. The strongest fact why Hector Espino returned from AAA to mexican baseball was because Anuar Canavati (then owner of club Sultanes of Monterrey) refused share a part from his contract sale. Espino himself claimed that. A mistake written your post is “he managed” Naranjeros. That’s false, he never was the skipper but he was the hitting coach for many years for Hermosillo. “Child murderer” is another mistake for his nickname. Perhaps it lost in translatioon. The correct one is “Killer kid” and “Superman from Chihuahua” for his hitting abilities. I had the chance to meet Hector Espino back in 1978 while he was playing with the Hermosillo Orange growers (Naranjeros). He was staying at a hotel in Guaymas, my hometown, with the rest of his team and I was by the pool reading the newspaper when he approached me and asked if I could lend him the paper. Of course I did, marveling that, the great Espino was just seating next to me reading the news like a mere mortal. I had the chance to meet Francisco Barrios that same day and a good number of players including Alex Lizarraga who eventually became my friend.